Guernsey Nos. 46 (2001) and 6 (2002). Adam Pickering was a right-footed defender/midfielder who was rookie-listed by Carlton in 2000, and had the misfortune to arrive at Princes Park a year before the worst-ever season in the club’s history. He eventually played seven senior games (starting on the bench in six of them) but celebrated victory just once. The only time he was included in the Blues starting line-up, he had the misfortune to be on the end of one of the most humiliating defeats in Carlton’s history. Pickering was one of the many Blues picked up from Melbourne’s outer north. 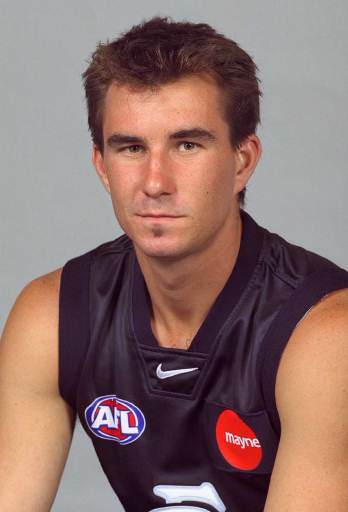 Originally from Craigieburn, he joined the Calder Cannons as a teenager, and represented Vic Metro in the 1999 Under-18 National Championships. Later that same year he played a couple of games with Essendon Reserves, before Carlton offered him guernsey 46 and a place on the club’s rookie list. In Wayne Brittain’s first season as senior coach of the Blues, the team was solidly in finals contention by round 19, 2001, when Pickering’s consistency with the seconds won him elevation to the seniors for an important Saturday night match against Adelaide at Football Park. Starting on the four-man interchange bench, he was injected into the game in the second quarter, only to be overwhelmed like the rest of his team. Adam collected six possessions, two marks and the thrill of kicking his only career goal, as the Crows demolished their visitors by 53 points. Omitted for the next week’s victory over St Kilda, he came back into the side for round 21, and experienced the joy of victory for the only time in his AFL career when Carlton smashed Collingwood by 68 points in front of 70,000 on a Saturday afternoon at the MCG. Pickering had little real impact however, and his stats sheet after the game showed all single figures. He then finished off the season with the Reserves, while Brittain took his Blues through to the Semi Finals and a hard-fought, narrow loss to Richmond. During the off-season, Pickering was encouraged by being elevated to the Blues senior list, and switched to guernsey number 6 when Murray Vance was let go. But he had to wait seven weeks until his next opportunity at senior level, and by then the Navy Blues were in crisis. The retirement of champion full-back Stephen Silvagni, on-going knee problems for match-winner Anthony Koutoufides, and lesser injuries to a raft of other players including Brett Ratten, Lance Whitnall, Matthew Allan and Darren Hulme sent the Blues into an early tail-spin from which they never recovered. Pickering came off the bench to collect 15 possessions against Hawthorn in round 8 and another 14 in round 9 against Adelaide, only to be one of seven players omitted following that dismal result. So he went back to the Reserves, persevered, and was eventually recalled for Carlton’s most important match of the year to that point – a Friday night blockbuster at the MCG against third-placed Collingwood in round 18. For the Blues, the looming threat of finishing on the bottom of the ladder for the first time ever in Carlton’s proud history was all too real, and should have given coach Brittain ample cause to rally his team. One of three inclusions, Pickering was named in the starting line-up in a back pocket alongside Simon Wiggins and Callan Beasy – which in itself is a clear indication of Carlton’s desperate plight at the time. In front of 54,000 at the ground (and many times that watching on live broadcast) the Blues never gave a whimper, and were demolished by 108 points. The only consolation for Pickering after that disaster was that he retained his place in the team for round 19 against Port Adelaide - although he was once again relegated to the bench. Carlton had a crack before losing by 9 points, and Pickering didn’t trouble the stats men in what turned out to be his last AFL game. Adam was delisted at the end of 2002, only to be thrown a lifeline by Richmond. The Tigers added him to their rookie list, and he spent a year at Punt Road without getting an opportunity at senior level. Then in 2004, Pickering and his good mate Andrew Merrington were head-hunted by WAFL club East Perth. Both former Blues went on to fine careers with the Royals, and became stalwarts of the club. In Pickering’s case, he played over 100 games in seven seasons, finally retiring in 2010 after the Royals lost the WAFL Preliminary Final to Swan Districts. Pickering from 111 games and kicked 36 goals for the 'Royals' from 2004 to 2010. Pickering would then enter the coaching ranks by taking up the position of an assistant coach in 2011. The next six years Pickering had various coaching stints at reserve grade in the WAFL (Perth 2012-13), East Perth (2014-15) and then East Perth Colts (2016-17). Swan Districts then appointed Pickering into senior WAFL coaching ranks for the first time after signing him for two years. He was also an assistant coach for the WAFL state team in 2013. Pickering will take over from outgoing Swans coach Greg Harding, who resigned this season after seven seasons at the helm. Contributors to this page: Bombasheldon , PatsFitztrick , molsey , tmd1 , BlueWorld , true_blue24 , Jarusa and admin . Page last modified on Friday 29 of December, 2017 12:35:40 AEDT by Bombasheldon. 1972 - Snippet on Ex Blue Gordon Casey.